A vulture raised by gay parents has been released into the wild as part of a conservation programme. Artis Amsterdam Royal Zoo set two birds free in Sardinia, a year after they were born in the Dutch capital. One of the chicks was raised by two male vultures in a long-term relationship. The griffon vultures have been living in an aviary in Sardinia to acclimatise to their new surroundings ahead of their release. This pair are the latest of 12 griffon vultures to be released in Sardinia, as part of a conservation project called Life Under Griffon Wings. The two birds hatched in Amsterdam in April and May 2017. One of them was raised from an egg by a male vulture couple. Zoo keeper Job van Tol last year described the pair as “a very tight couple”. “We have had them for some years. They always build a nest together, bond and mate together,” he told the BBC. When staff found an abandoned egg which the other vultures would not care for, they decided to give it to the male vultures. It was the zoo’s first successful hatching in five years. 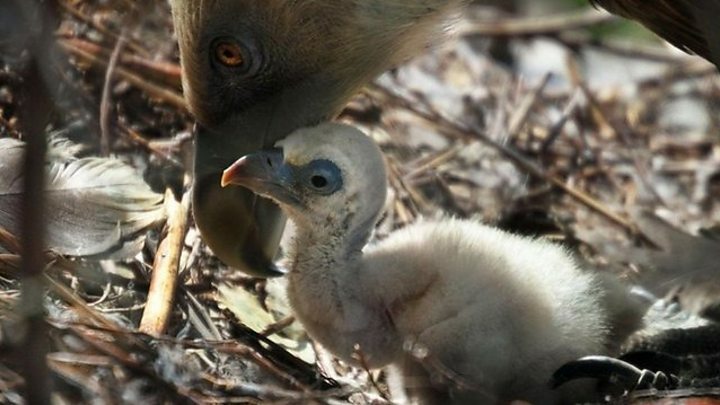 The second vulture was raised by heterosexual parents being cared for in captivity after they were hurt in a road accident in Spain. The director of the zoo, Rembrandt Sutorius, went to the Parco Regionale di Porto Conte in the northwest of Sardinia to set the two birds free. “We could see the vultures floating above the area – a truly magnificent sight,” he said. The pair were brought to the island before their release to acclimatise to their surroundings. Staff will continue to feed them carcasses in a fenced off area to allow them to slowly adapt to their freedom. Conservation efforts for European vultures began after a drop in numbers from the 1970s onwards, largely due to farmers leaving out poisoned carcasses on their land to kill predators. A 2013 census found only 30 pairs of vultures left on Sardinia.